The army's dropping of all charges on March 19 against U.S. Army Captain James ("Yousef") Yee – including those of spying, mutiny, sedition, aiding the enemy, and espionage – is seen negatively by others in the Judge Advocate General's corps tasked with handling comparable spy cases. One military prosecutor notes that Chaplain Yee was credentialed by an organization now under investigation and that he took very questionable actions at Guantánamo Base and concludes that "the Army blinked." Captain Yee's punishment amounted to a mere reprimand. There remain, however, three other criminal cases that concern Guantánamo and espionage: (1) Ahmad F. Mehalba, a civilian interpreter charged with lying about the computer CDs in his baggage which contain classified information from Guantánamo; (2) Army Reserve Col. Jack Farr, charged with improperly transporting secret documents and lying to investigators; and (3) Air Force Senior Airman Ahmad I. al Halabi, my topic here. 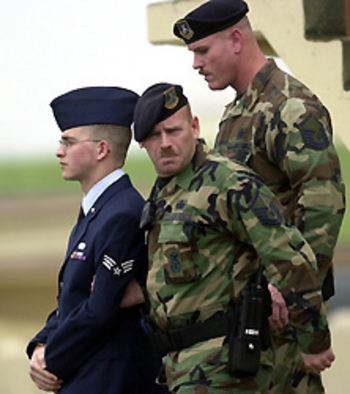 Senior Airman Ahmad al Halabi leaving his arraignment at Travis Air Force Base on Jan. 13, 2004. Halabi, a 25-year-old translator of Syrian origins, says he was naturalized as a U.S. citizen after joining the Air Force in January 2000, though this is a disputed matter. He spent nine months working as an Arabic language interpreter in Guantánamo and was arrested on July 23, 2003, at Jacksonville Naval Air Station, on his way to his own wedding ceremony in Syria. When apprehended, he had 186 unauthorized classified documents on his laptop computer. Collecting 180 messages from those detainees with the intent to deliver them to known enemies. One charge accuses al Halabi of delivering unauthorized food, including baklava pastries, to detainees. Another charge accuses al Halabi of "executing a scheme" to obtain credit from seven banks by providing false information. A third charge accuses al Halabi of denying any knowledge of Wahhabism, when the "statement was totally false." … It is unclear what connection, if any, the Wahhabism has with the espionage charges. In January 2004, the Air Force dropped several of the most serious charges, including the single count that carried the death penalty, that of "aiding the enemy." Other dropped charges concerned e-mailing information about Guantánamo detainees and transmitting information to unauthorized recipients. Halabi now faces seventeen charges; the court-martial, expected to begin April 27, 2004, at Travis Air Force Base in northern California, could send him to prison for life without parole. During court-martial proceedings, military prosecutors revealed that Halabi is also the subject of a second, separate counterintelligence probe; and he may face criminal charges in addition to the spying charges. At the court-martial, Halabi will likely proclaim ignorance that the documents he was carrying were classified. But that will be a tough sell, as early on he acknowledged as much to investigators; and he also postal mailed 60 pages of classified documents to his home in California. The website contains a miscellany of items that interested Halabi. He lists news from Arab League member states, the Islamic prayer times, pictures of Arab pop music stars, airplanes, and the like. Only authorized persons may view this page. Clicking on "Go to Ahmad's Picture in Cuba" then brings up three pages of pictures of Halabi. The first has pictures taken at Captain Yee's residence, with a tughra-style "In the Name of God, the Compassionate, the Merciful" at the top of the page. The second posts standard military-style pictures of Halabi in Kuwait – standard except for the anomalous presence of the Syrian flag waving at the top of the page. The third seems to be a Muslim-only page, with captions like "Group picture on EID Day," "EID party, Dec 6 2002. From Right To left, Ahmad, Tabasom, Katib, Chaplin Yousif and Ahmad," and "On the ferry from Right to left: Rabi, Tony, Bahlawan, Tariq and Ahmad." This page features both the tughra and the Syrian flag. 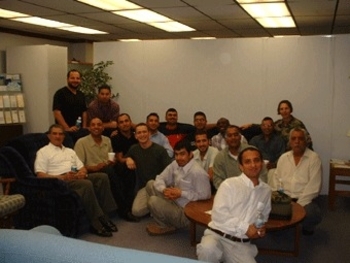 Ahmad al Halabi's picture of Muslim military personnel celebrating Eid al-Fitr at Guantánamo on Dec. 6, 2002. In preliminary arguments, prosecutors stated that while Halabi was undergoing a preliminary hearing, someone accessed his website and altered it. Worries about Halabi's computer skills are one reason why he will remain incarcerated as his case moves forward. In the words of Military Judge Col. Barbara Brand, "His computer prowess continues to pose a threat." Halabi's website spurs two thoughts. First, Halabi appears to be computer savvy enough to have sent off information without the U.S. authorities being aware of what he had done. Second, according to a search warrant prepared to have access to his mail, Halabi "made statements criticizing United States policy with regard to the detainees and U.S. foreign policy in the Middle East," then lied about making such statements. Combining this hostile political outlook with the nearly exclusive focus on fellow Muslims in the web pages leads this observer to wonder about Halabi's loyalties. April 16, 2004 update: A group calling itself the Airman Halabi Justice Committee has created a website, "Justice for Ahmad Al-Halabi," to promote Halabi's cause and raise money for him. Two aspects of this site catch my attention. A Muslim is a brother of a Muslim … If anyone fulfills his brother's needs, Allah will fulfill his needs. If anyone relieves a Muslim of his troubles, Allah will relieve him of his troubles on the Day of Resurrection. In the context of a website calling to help an American serviceman, this quote has the unsettling implication that a Muslim's first loyalty is to his fellow Muslim, and not to the country he is serving. Second, that the website on both its links page and its contacts page lists the Council on American-Islamic Relations points to the leading militant Islamic organization in the United States taking up the cause of a soldier accused of spying, something consistent with its being, as I have often accused it, on the wrong side in the war on terrorism. Apr. 24, 2004 update: A Washington Post article today by John Mintz on the Halabi case indicates that an Air Force investigator "spent 800 hours examining the Halabi Web site for evidence, and officials said last month they still suspected that there are hidden features in the site that allow outsiders to gather information secreted there." May 7, 2004 update: Umar Abdur-Rahman, executive director of CAIR's Michigan office, today sent out to his e-mail list an "emergency appeal" to raise $50,000 for a Civil Rights Fund to support Halabi's defense. Sep. 22, 2004 update: The military dropped attempted-espionage charges against Halabi and he in turn agreed to plead guilty to four lesser counts. Perhaps the most significant part about the personal webpage I had – a rudimentary webpage on Yahoo! 's free public service Geocities is that it had been created using Geocities "Pagebuilder" program, is a simple Java-based interface that allows users with no knowledge of HTML (or even much computer savvy at all). I placed pictures of myself in and out of uniform and during deployments, pictures of fiancée, links to mainstream newspapers and musicians, as well as pictures of aircraft in the Air Force inventory. If the webpage indicated one thing to a viewer, it would be that I was deeply patriotic, but also very proud of my service in the Air Force. The claim the website was anything more than basic or had any "sophistication" would have been uproariously funny. There was no "limited access sites," and nothing about the site required a password. I also created a second page of pictures of Rana. This page was Rana_1.html. It contained four pictures of Rana, but page was not complete, so there were no links to the page from any of the other pages, however anyone at all could view either (or both) of the Rana pages on the internet by simply typing in the whole address into a web browser (e.g., by typing in www.geocities.com/ahmad564/Rana.html, a surfer would be taken directly to that page). I trust this gives more explanations & details – and hope that you reconsider and either remove or amend this article and/or title. Thanks in advance.